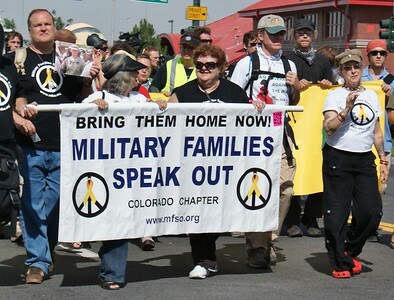 Images from the 2008 DNC in Denver including protests against the Iraq war, police in riot gear. 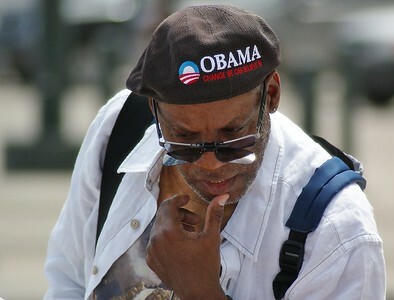 Man wearing Obama hat looks at merchandise for sale at the 2008 DNC in Denver. 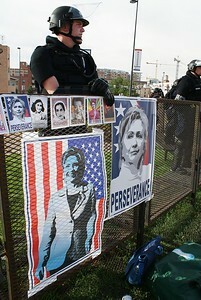 Police officer in riot gear standing behind a fence with Hillary Clinton posters on it. 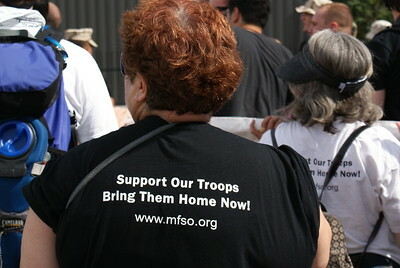 Vendor at the 2008 Democratic National Convention in Denver. 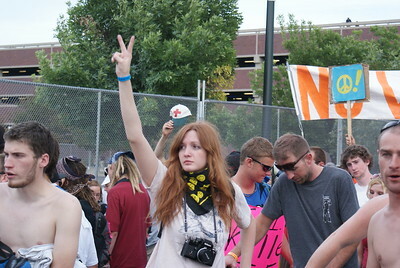 TV new cameraman shooting pictures of spectators at the 2008 Democratic National Convention in Denver. 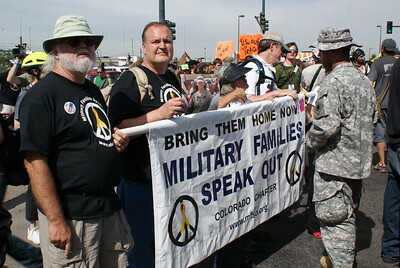 MSNBC reporter Norah O'Donnell interviews a guest on an outdoor set at the 2008 Democratic National Convention in Denver. 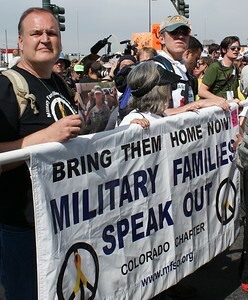 Members of "Military Families Speak Out" were among protesters at the 2008 Democratic National Convention in Denver who joined a march against the Iraq war. 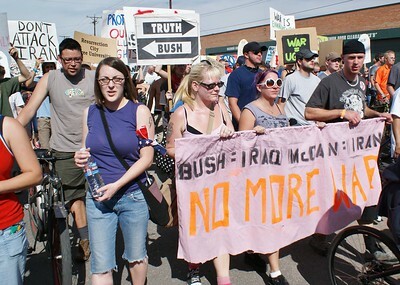 Opponents of the Iraq war marched at the 2008 DNC in Denver. 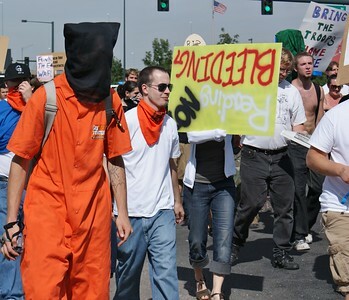 Man wearing orange jumpsuit and hood over his head as protest against conditions at Quantanimo, marches against the Iraq war at the 2008 DNC in Denver. 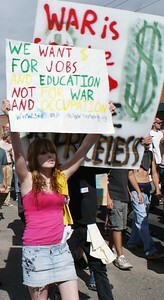 Young woman marches against Iraq war at 2008 DNC in Denver. 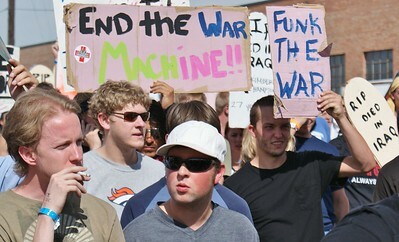 Group of young men carry anti-war signs during march at 2008 DNC in Denver. 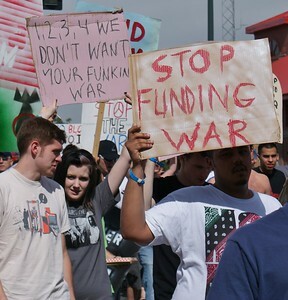 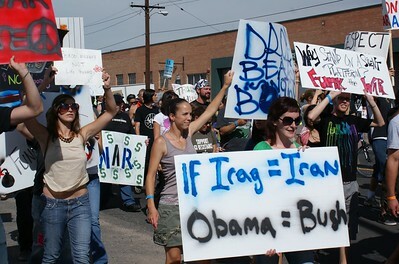 Protesters with signs and banners march against the Iraq war at the 2008 DNC in Denver. 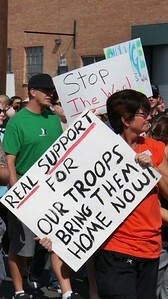 Two men at the 2008 DNC holding a "Rednecks For Obama" banner. 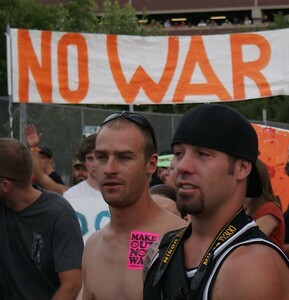 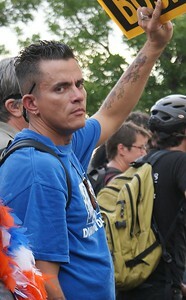 Anti Iraq war protester at 2008 DNC in Denver. 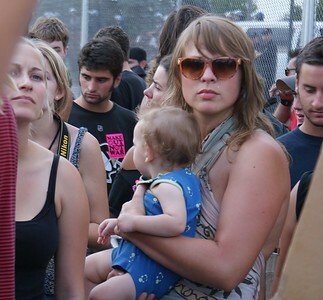 Young mother and child were among protesters against the Iraq war at the 2008 DNC in Denver. 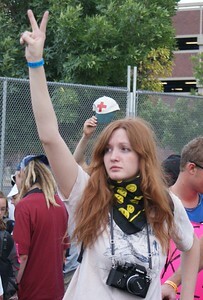 Young woman raises hand in "peace sign" during march against the Iraq war at the 2008 DNC in Denver. 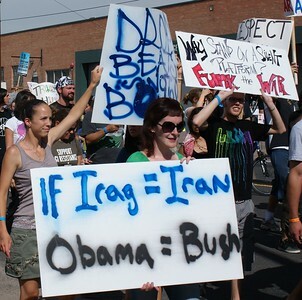 Anti Iraq war protesters at 2008 DNC in Denver. 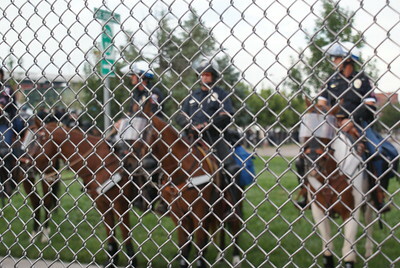 Police on horseback at the 2008 DNC in Denver. 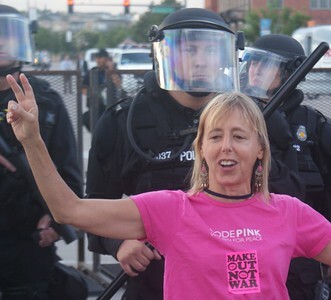 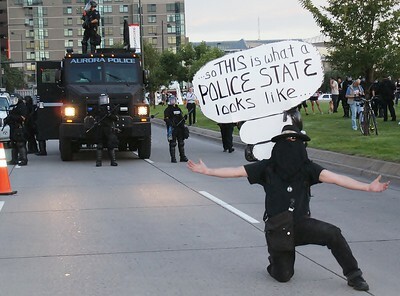 "Code Pink" member Medea Benjamin flashes the peace sign in fron of police in riot gear at the 2008 DNC in Denver. 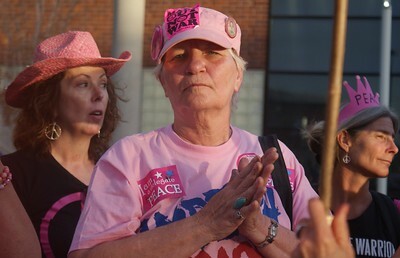 Members of "Code Pink" were among anti Iraq war protesters at the 2008 DNC in Denver. 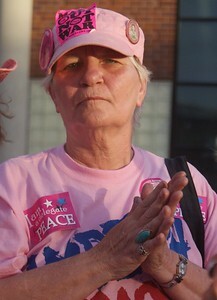 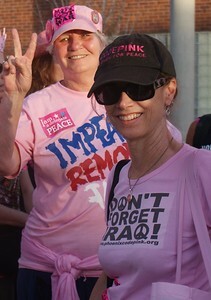 Member of "Code Pink" was among anti Iraq war protesters at the 2008 DNC in Denver. 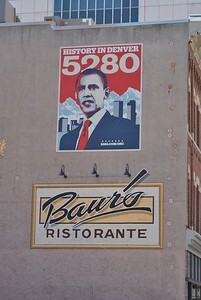 Then Senator Barack Obama, pictured on a large poster on the side of a building in Denver during the 2008 Democratic National Convention. 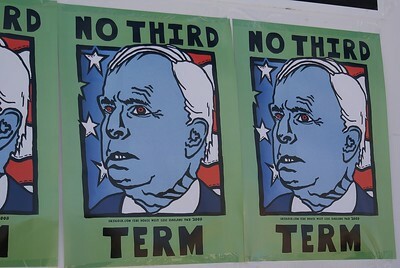 Anti John McCain poster on wall at 2008 DNC in Denver. 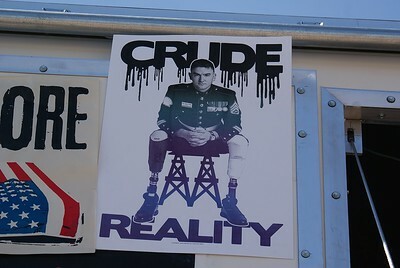 Anti Iraq war poster depicting Marine with prosthetic legs. 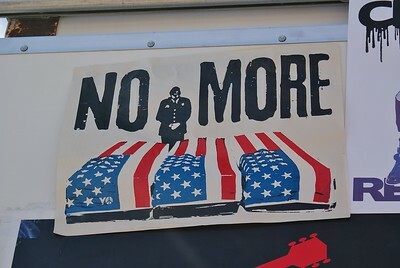 Anti Iraq war poster depicting flag draped coffins. 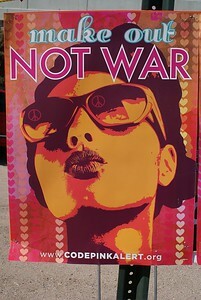 "Make Out Not War" poster displayed at 2008 DNC in Denver. 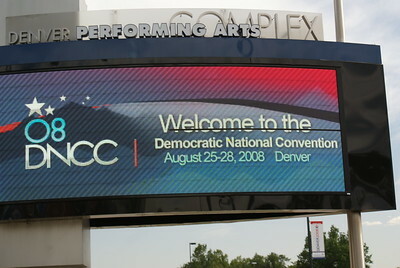 Electronic sign greeting attendees of the 2008 DNC in Denver. 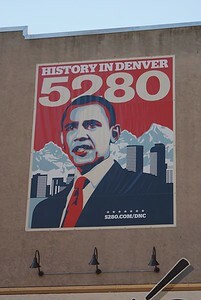 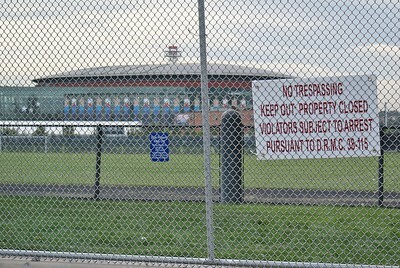 The "Pepsi Center" in Denver, scene of the 2008 Democratic National Convention. 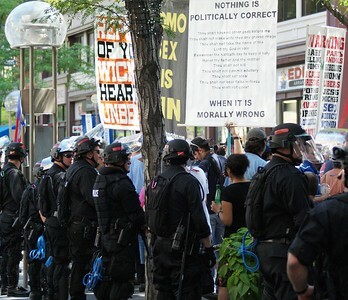 Anti-abortion protesters surrounded by police on 16th Mall in Denver during the 2008 Democratic National Convention.